Star riser metal casting with gold tone finish. Star trophy carved from a block of optical crystal. Stars are a universal symbol of achievement, recognize your high achievers with the highest quality optical crystal. Packaged in padded, satin-lined gift boxes. 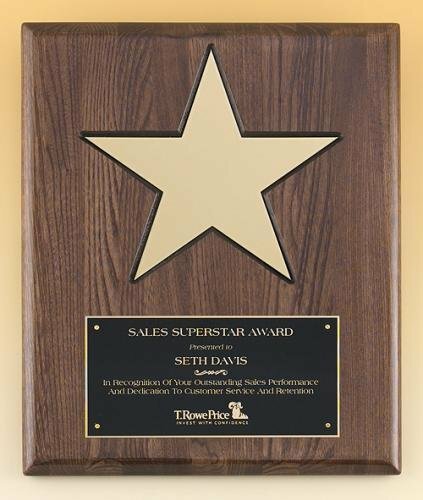 Gold aluminum star (8") on walnut stained Piano Finish plaque with black recessed area. The same production techniques used to give expensive grand pianos their glossy look is available as a recognition award. Over six layers of lacquer are hand applied and polished to create our plaques. Individually boxed.